Are you 50+ and interested in singing? Enrolment is open! 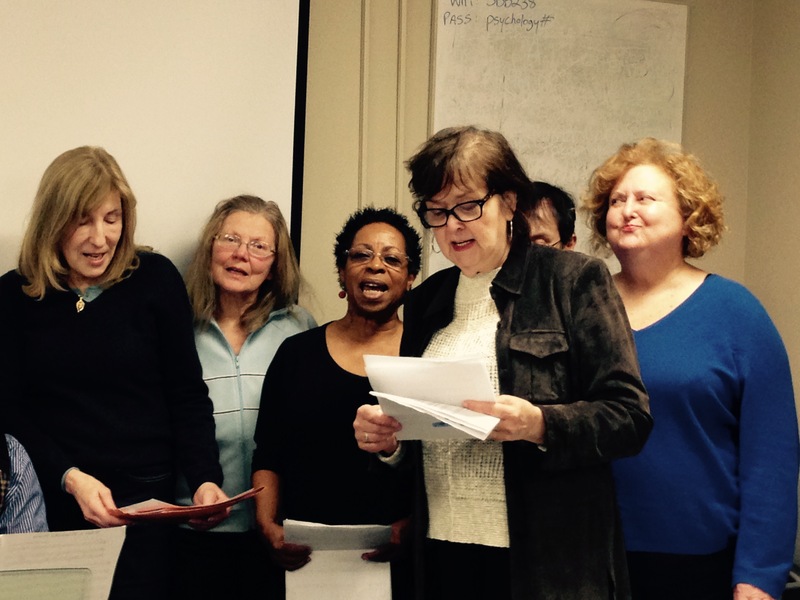 The CSMU 100 Choir program offers singing and ear training in a group setting. The repertoire includes classical, contemporary, and folk, and no musical background is required. The course offers a voluntary research component, where you’ll have the opportunity to contribute to our research! Please click here for more information on the CSMU 100 Choir program. For more information on our research, please read below. Seniors Improving Neurocognitive Goals through Song (SINGS): Teaching your brain to hear better while learning how to sing. As we age, most adults experience some degree of hearing loss. Although hearing aids can be used to amplify sound, many adults suffering from normal age-related declines simply learn to live with this impairment. One issue that both aided and un-aided older adults experience is a difficulty tracking speech in a noisy environment, making it hard to hear one person talking in a crowded room. This has been linked to an age-related degradation of the neural mechanisms with which the brain encodes auditory signals; basically, as we age, our brains get worse at processing what we’re hearing, making it harder to distinguish a relevant voice from background noise. This can make it harder for aging adults to participate in group conversations and social events, which can lead to feelings of isolation and emotional withdrawal. As such, finding a way to help people preserve and regain this ability is essential. One thing that seems to help is a life of music. Aging musicians have been shown to experience less neuronal degradation in auditory signal processing than non-musicians, along with an enhanced ability to track pitch changes and voices in a noisy environment. However, short-term musical training has not yet been explored as an intervention to assist those already suffering from hearing loss. Researchers at Ryerson University’s SMART Lab are asking the question: can we use music to help older adults train their brains, and in doing so, improve their hearing? And can we make the process engaging and fun? The current study investigates whether taking part in a 10-week group singing program can improve hearing and cognitive functioning in aging adults. Participants (aged 50+), recruited through the 50+ program, take part in weekly group choir sessions and complete online musical training for 10 weeks. Individuals come into the lab at the beginning and end of the program, for pre- and post-training assessments of hearing and cognition. Early findings are very promising; participants show significant improvements in speech-in-noise perception, pitch discrimination, and the neural response to sound, as well as cognitive measures of attention. These results lend support to the use of choir participation and musical training as an intervention for older adults, to help mitigate age-related auditory and cognitive declines. Don’t be surprised if someday your family doctor recommends joining a singing group to help with your hearing! Many older adults who experience little difficulty hearing in quiet environments will report having trouble understanding speech in the presence of competing background noise. This is often first noticed when attempting to follow a conversation at a large social gathering, in which many people are talking at the same time. While amplifying the audio signal through a modern digital hearing aid equipped with noise reduction can often go a long way towards correcting the problem, in many cases there is still a residual difficulty that persists. Part of the problem may lie in age-related changes in the brain. Specifically, many older adults experience a degradation of neural timing in brain mechanisms responsible for encoding the pitch of the voice. Being able to follow the pitch of a speaker’s voice helps to alert the listener to conversational cues, particularly in noisy situations. Several researchers have recently proposed the idea that musical engagement may be a means of supporting this neural timing. Research has found that musicians show significantly less age-related decline in their ability to detect speech in noise as compared to non-musicians. Further, studies have shown that musicians demonstrate more precise neural timing as compared to non-musicians. Actively engaging in music requires the ability to track and discriminate multiple sources of complex sounds, just as a listener must do when attending to a single voice among many. However, studies have not shown that being a musician directly increases the neural timing of sound. So far studies have only shown that musicians happen to show more accurate neural timing than non-musicians. For our current study, we are interested in determining whether older adults with mild hearing loss can show improvements in their ability to understand speech in noise as a result of short-term musical training. 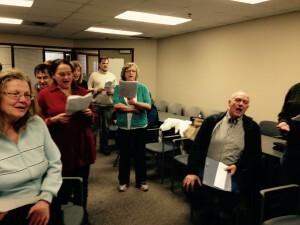 Specifically, we are testing the effects of singing training through group choir lessons. Since January of 2015, 14 older adults have attended weekly choir sessions over a 13-week period. Participants were also required to complete one hour of homework per week, through the use of online music training software, designed to aid users to improve voice pitch control. So far, the results are very promising. There has been significant improvement in the ability to perceive speech in noise as a result of the choir training. In addition, participants have shown improvement in their ability to discriminate pitch, which is important for tracking speaking voices. These preliminary findings suggest that short-term musical training is able to mitigate some of the age-related difficulty in hearing that is experienced by older adults.